Othello and Desdemona - all photos: Ute Langkafel MAIFOTO. A theatre within the theater. 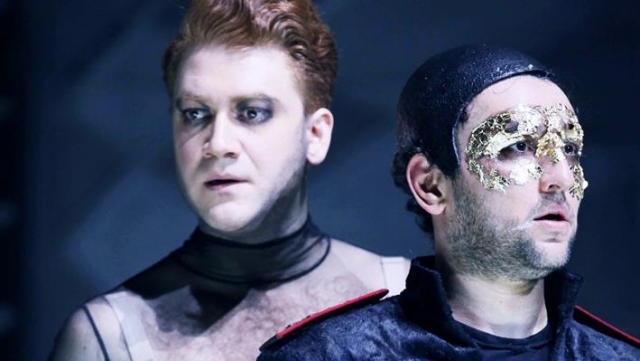 “Othello,” a dialogue to Shakespeare's drama by Soeren Voima and directed by Christian Weise, is grand theatre a la Commedia dell'arte at the Maxim Gorky Theater in this smallest of Berlin houses. 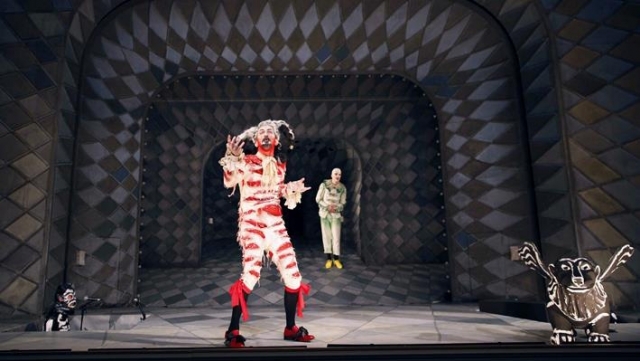 Shakespeare's Othello is diminished into a timid human voice amid bombastic clowns. He, at the end, succumbs to the puppet-like lives of his surroundings, and Desdemona remains alive – sort of. What a statement of theatrical engagement reflecting the multitude of cultural influences and political differences in present day Berlin and Germany at large! The Executive Director Shermin Langhoff and her Artistic Director Jens Hillje will, deservedly, receive the important Theaterpreis 2016 (Theatre Prize 2016) on May 15, 2016 as pinnacle of the Berliner Theatertreffen at the Haus der Berliner Festspiele. Since the 2013/14-season, they have been turning this formerly sleepy theater around due to their extraordinary and diverse productions with a multicultural ensemble. 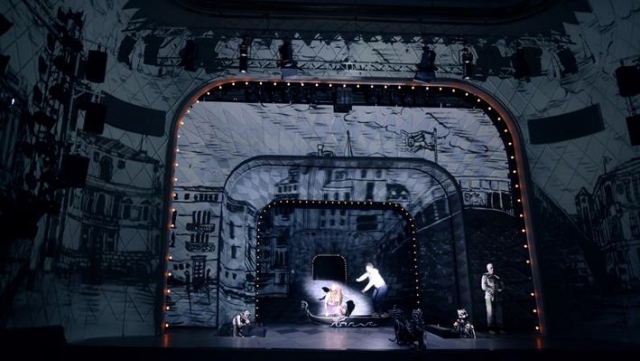 Extraordinary, over the top is this work, with a splendid stage setting of a theater within the theater that spills over into the theater hall with moving projections. Just opened on February 19th, it has already caused many positive and negative comments. Not everybody will like the diminished stature of Shakespeare's hallowed Othello into a weak human being played by the Turkish-German Taner Sahintürk as the only human between automatons acting in low comedy exaggerated moves. As he turns more and more into a puppet to all the political intrigue surrounding him, the others become more human. The tour de force performances are sometimes downright silly, but mostly hilarious and stunning, especially the ones by the fabulous Thomas Wodianka as Jago, with Falilou Seck's as his wife Emilia. Oscar Olivo's bravura performance as a gay fop Cassio, and by Till Wonka as Rodrigo and Baccio respectively. All roles are played by men, reflecting gay life as camp. At times, this overkill leads to negative reactions, especially in the performance by Aram Tafreshian as Desdemona. As the play within a play is reflected wonderfully in the stage setting of Julia Oschatz, the performances vary a bit much. The whirlwind happenings on the stage confuse more than bring the message of the loss of human dignity across. 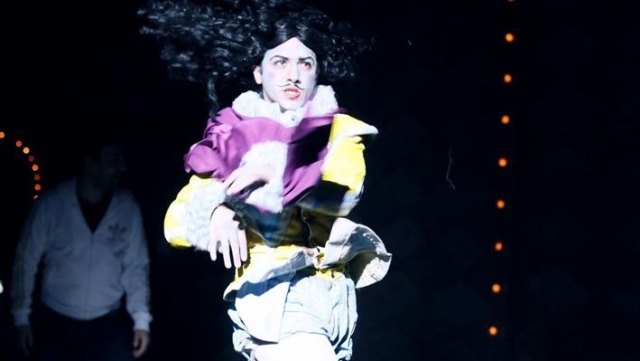 It muddles the impact, when Commedia dell'arte figures in their time honored costumes play side by side to Othello's modern approach to human suffering, and when an unnecessary gay exposure of nakedness by Desdemona seems incongruous. But, perhaps, this is a perfect semblance of the confused state of affairs in Berlin, in Germany and the world!